Reading up on the latest celebrity news is a bit of guilty pleasure for us all but celebrity weddings and celebrity wedding fireworks are a different story. Not too long ago, many of us had our heads glued to the TV anticipating Prince Harry and Meghan’s wedding while others were camping outside the location for days to get a good view of the event. We all love indulging in a bit of luxury but it’s even better when you can have a happy ending to go with it (for some of the celebrities on here at least). As little girls, many of us dreamt of having a fairy tale wedding so there’s no harm in splashing some cash on your big day to make it extra special! So what do all these unforgettable weddings have in common? An abundance of floral decorations, phenomenal fireworks displays and breathtaking wedding dresses! When you see Brad Pitt, the first name that probably comes to mind is Angelina Jolie especially since their divorce news has hit headlines. But rewind to over a decade ago and he was crazy in love with Jennifer Aniston. The Hollywood stars met in 1998 after being set up on a date by their agents and were engaged after two years of being in a happy relationship. 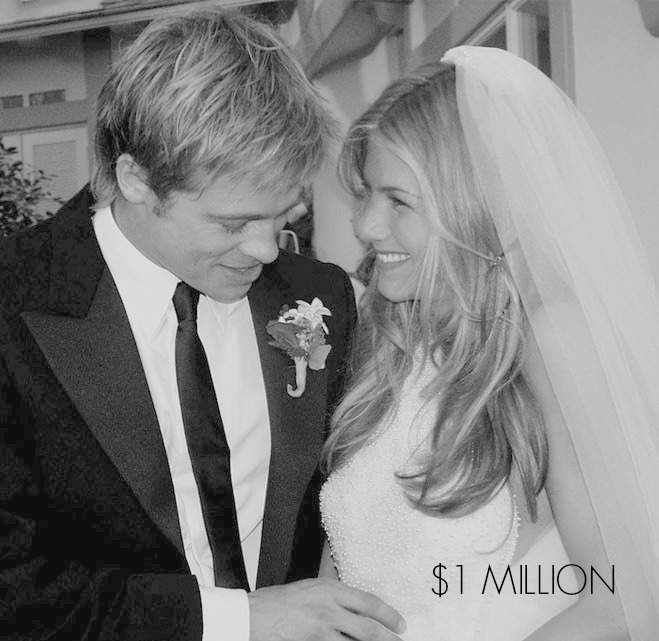 In 2000, the couple began planning their extravagant $1 million Malibu wedding. It took place in an enormous mansion and the couple kept the ceremony intimate with only 200 guests. The decorations included a flower-bedecked canopy and over 50,000 flowers. Guests also enjoyed entertainment from four bands, a gospel choir and a fantastic fireworks display. “TomKat” is a personal favourite of ours. Everything about their story was movie-like and very romantic. They met in 2005 and after dating for only six weeks, Tom proposed! But it wasn’t just any ordinary proposal; he got down on one knee on the Eiffel Tower just after midnight during a candlelit dinner. In 2006 they had baby, Suri Cruise then began planning their big day! The couple opted for an Italian wedding in a 15th Century castle. Their guests included many celebrities including Jennifer Lopez and Will Smith. After their romantic first dance to Fleetwood Mac’s “Songbird,” the couple cut their cake and treated guests to an extraordinary fireworks display. Father of Petra, business magnate Bernie Ecclestone spent generously on his daughter’s big day which saw the couple wed in the same location as as TomKat. 350 guests were invited to the three day extravaganza where they were treated to live shows by Black Eyed Peas, David Guetta and a brilliant fireworks show just after midnight. Shame it all had to end. 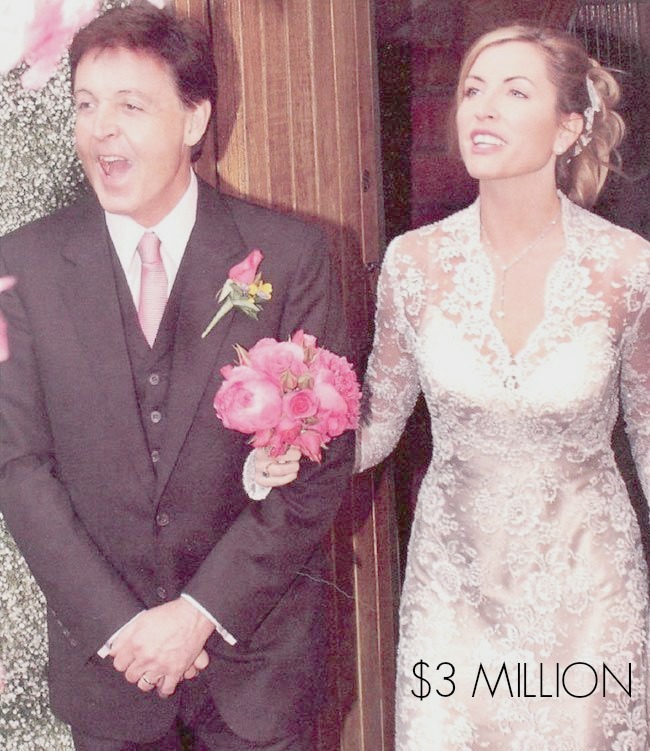 Although the couple didn’t last very long, the former Beatle Paul’s wedding to model Heather Mills in 2002 was certainly an unforgettable fairy tale. It took place in the private grounds of a remote castle in Glaslough, Ireland. They tied the knot in a 17th Century chapel before 300 close friends and family. Mills made her entrance in the song “Heather” by McCartney in an outstanding lace dress she designed herself. The evening consisted of a pageant and a fabulous fireworks display. The event was described as the “wedding of the century”. Over 1,900 guests were lucky enough to witness their big day including a few VIPs such as David & Victoria Beckham. 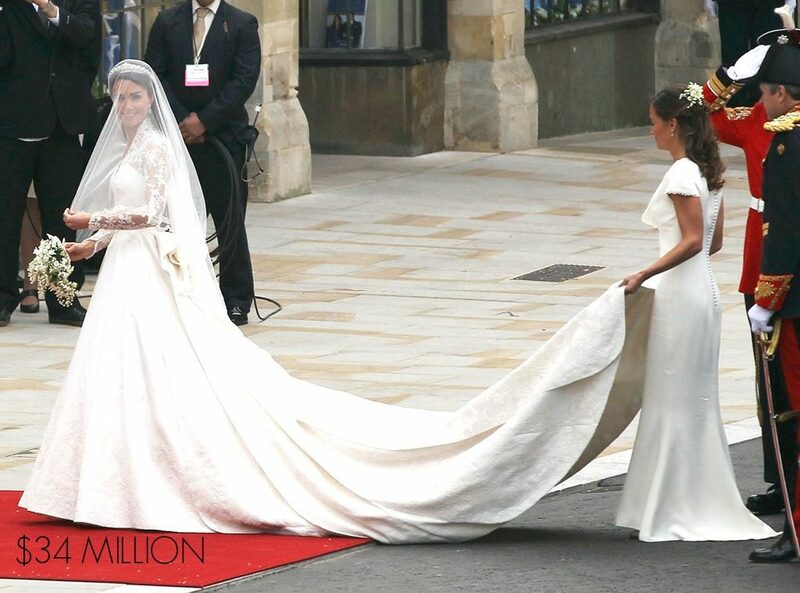 Everything about the day was perfect as you would imagine but we couldn’t get our eyes off her Alexander McQueen gown designed by Sarah Burton, it was absolutely breathtaking! There were two evening receptions, one of which was in Buckingham Palace and it included a phenomenal fireworks display and non-stop enjoyment until the early hours of the morning. Here’s more information on how to get a professional fireworks display for your wedding.